When: 11am – 4pm, Saturday, 8 August. 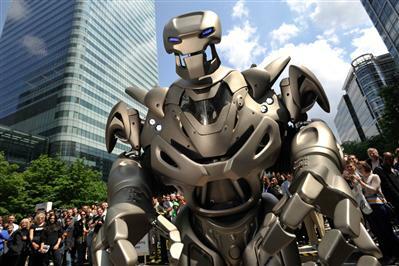 A huge superstar robot, which has appeared on stage with Rhianna and at major events around the world, will be among major attractions at the Stoke South Carnival on Saturday (8 August). Titan the Robot will thrill the crowds at the popular annual carnival which is being held at Fenton Park, from 11am to 4pm. The Stoke South Carnival Committee, which is made up of local volunteers, have teamed up with the Appetite arts programme to organise a fun-packed event. While Titan the Robot, standing at 7.9ft tall, will be a huge attraction, he will be competing for attention with the tiny Hodman and Sally puppets; an interactive show from street theatre group the Flying Buttresses. Alongside all the traditional fun carnival attractions, visitors will be able to join arts group, Theatre Rush, as they showcase The Story Exchange, an interactive, walkabout performance based around a writing desk on wheels. The carnival also features a display of military vehicles, a dog show, funfair rides, vintage buses, dance performances and cavalry horses. “The Stoke South Carnival Committee is made up of a small group of enthusiastic volunteers who are extremely passionate about putting on a memorable, exciting and enjoyable event for the local community,” said Emily Andrews, who works for Appetite in the Stoke-on-Trent South area.